I knew with the upcoming final weeks of my bird season here in Colorado that quail and pheasant were nearly out, crops had been harvested and that the birds would be bunching up. Another somewhat interesting wrinkle being thrown into the mix was that on this upcoming Sunday where I wanted to hunt was going to be 55 degrees, in mid January. This was something I was not entirely prepared for. 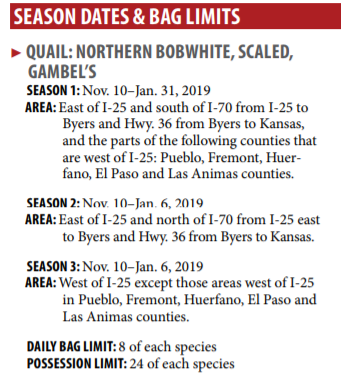 Quail at this point in the season are only legal in the bounding box created by East of I-25, South of I-70 until you get to Byers, CO where the upper bound becomes CO-36 and the box is ran all the way to the Kansas line. See below for the description. It’s not that hard, but it takes some mental gymnastics to keep it straight. 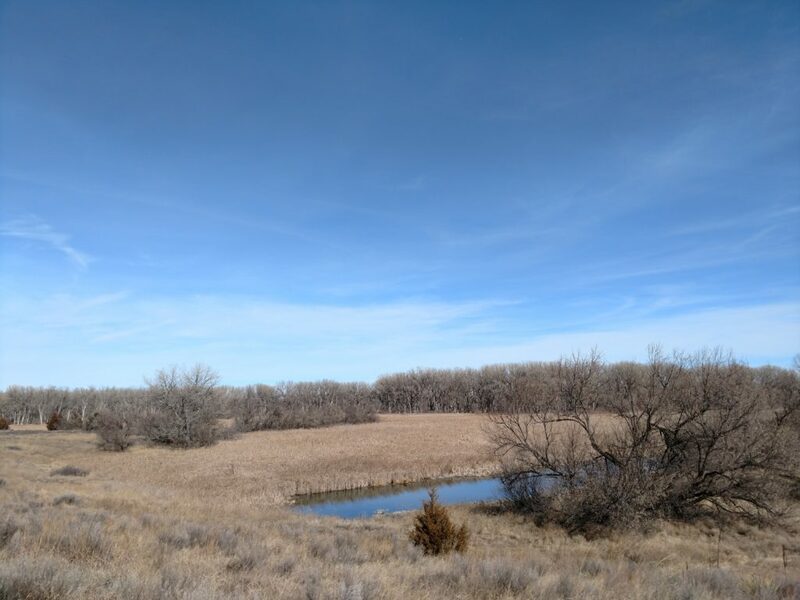 Knowing I had a heatwave and that I wanted to maximize hunting whatever species that were open by hunting both quail and pheasant I set out to do what I would do any other time the heat was turned up unseasonably warm. Find water. 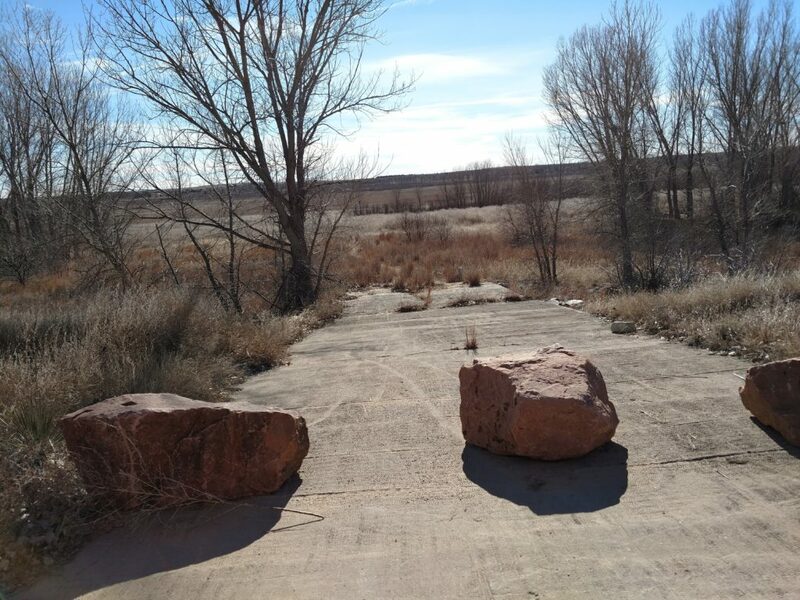 I set out to look for State Wildlife Areas in my hunt zone that had a water source. The South Republican River SWA and the Flagler SWA both looked promising, and the former was a three hour drive from my house on the outskirts of Denver, the latter being on my way home — I could hit it as I was driving back. Both were centered around a reservoir which were quite prominent on the map. Perfect. Reservoirs with swampy fringes and thick cover was exactly what I needed on a day like Sunday. View from the boat launch. Later I realized that the CPW buildings with busted out windows and the campground with 4 foot weeds in the parking area were probably bad signs. One of the things that I used to teach as a Teaching Assistant in school was to vary your sources so as to not be duped into one point of view. 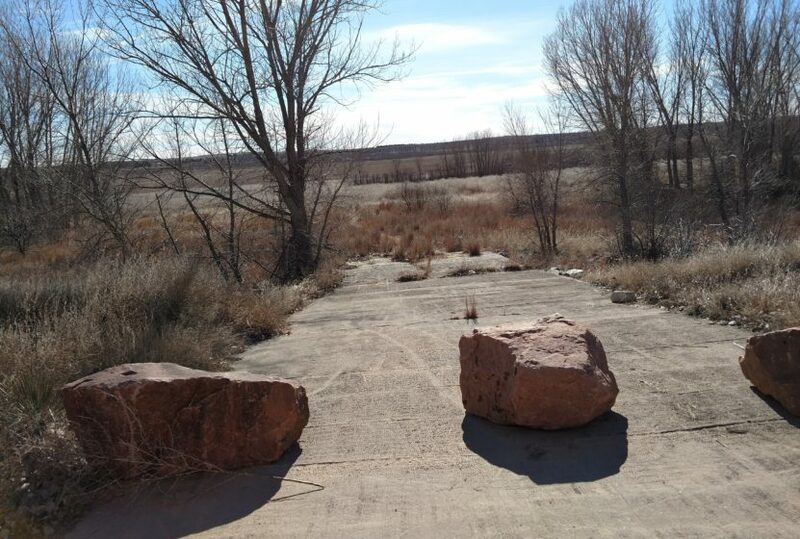 I’d been sticking mostly to researching new spots on the Colorado Parks and Wildlife website, to which the information on the Bonny Reservoir that was in this SWA seemed to be rather lacking. There was a single warning about the visitors center being closed. I didn’t particularly need to visit with anyone, but the intel that rangers can provide would have been welcome. Upon returning from my trip I did some further research and realized that I’d fallen into the trap I’d often warned students of. Had I varied my sources a little bit, I’d know that the reservoir was not only not maintained but also was little more than a mud hole. 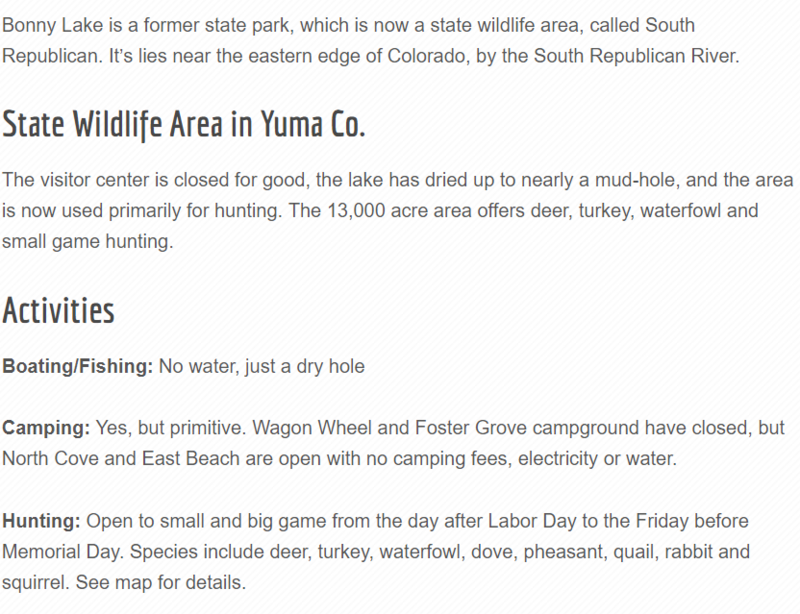 Below is the description from Uncover Colorado. While I made the most of my hunt there, traveling some six miles and seeing some critters, this was not the ideal situation I’d hoped for. Hunting water in the late season all but ensures some greenery and cover that the birds can use to their advantage. The shelter belts were good for rabbits, though I didn’t take a shot — my primary quarry was elusive until working fingers of timber in the “natural” ponds, squared off bulldozer dug drainages adjacent to the river. Cover made any shots quite difficult, but an enterprising waterfowler with some insulated waders would have been able to jump-shoot some mallards hiding in the pockets of open water. I worked some of the timber and finally heard the “Cack-cack-cack-cack!” cry of a rooster, unseen through the brush I’d been creeping through as if hunting ruffed grouse back east. That was enough to tell me that they were still there, even if most of the water wasn’t. Working the trees on dry fingers of land between the cattail marshes was productive, just not for the game I was looking for. South Republican River SWA. The heat took it’s toll on me and I had to sit in the truck and get a move on. I needed to get hydrated and unfortunately I’d only brought my small game hunting jacket and not a vest. It was 60F now and the sun was blazing. I’d seen only a few mallards, a cotton tail, and heard a rooster at this point. It was probably time to move on. I struggled with cell reception out that far and realized that short of bringing the CPW Late Cropland Walk-In Atlas with me my OnXMaps app was no good without an Offline Map of the area. Running out of steam with a two plus hour drive ahead of me I began to work my way home with one other access area in mind. Unfortunately on my long drive home I discovered Flagler SWA was entirely a wash for me. This time my research was incorrect by not reading the SWA specific regulations inside of the Small Game Hunting Guide. Flagler is only to be used as a Youth Mentor Hunting location. Pity, since it’s the closest eastern SWA to my home that doesn’t require a permit — the cover looks fantastic — but the reservoir is also dry, something I found out via the CPW website. I guess as a moral to the story, always ensure that you consider multiple sources when conducting your research for new hunting locations — especially ones you’ll spend half the day in the car driving to and from. Utilize online forums, Facebook, maps, digital mapping programs such as OnX, and don’t be afraid to call your local ranger for a little advice. Thankfully one place that isn’t dry in the state is my bar. I’ll be sipping on a gin and tonic dreaming about next season if you need me.